This year’s Elder Scrolls release has taken on an identity that we’ve never seen before from the long-running series. It features Dragonborn, a unique character born with the soul of a dragon, and most importantly showcases giant dragons of both the friendly and extremely destructive kinds. Unlike some of the previous releases, the protagonist’s story will take on a commanding presence of the game, and thankfully he’s as cool as he is ferocious. That same iconic character has been transformed into a statue for the sheer purpose of surprising one of the world’s favorite retailers. If you thought the giant Dragonborn poster in downtown Los Angeles or the amazing live-action trailer was cool, then you’ve gotta see this. 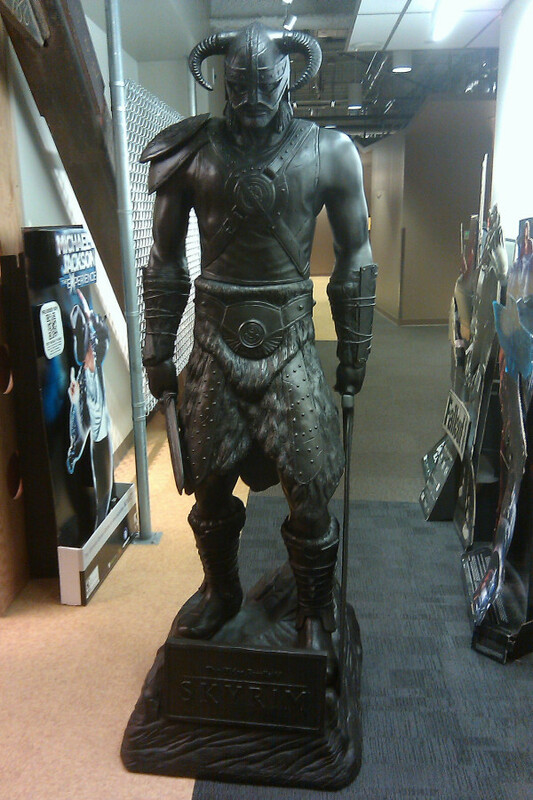 Bethesda has sent Amazon a life-size statue of the main character in The Elder Scrolls V: Skyrim, Dragonborn, and needless to say he looks awesome. To put the awesomeness of Dragonborn into perspective, the story will pit him against Alduin, the Nordic god of destruction. Even more epic is the fact that Alduin will be in dragon form, and he won’t be small either. We saw some of the “regular” dragons during this year’s E3, and they were absolutely titanic, and Bethesda has stated that Alduin will be much larger. Completely alone, Dragonborn will be responsible for fending off Alduin in order to protect the lands of Skyrim and Tamriel. It’s important to note that the events of Skyrim take place over 200 years after Oblivion, so other than some of the retained gameplay qualities, this will be a completely new experience for everyone. How’s that for a gift? Share how badly you’d like to feature this in your front window in the comments below.